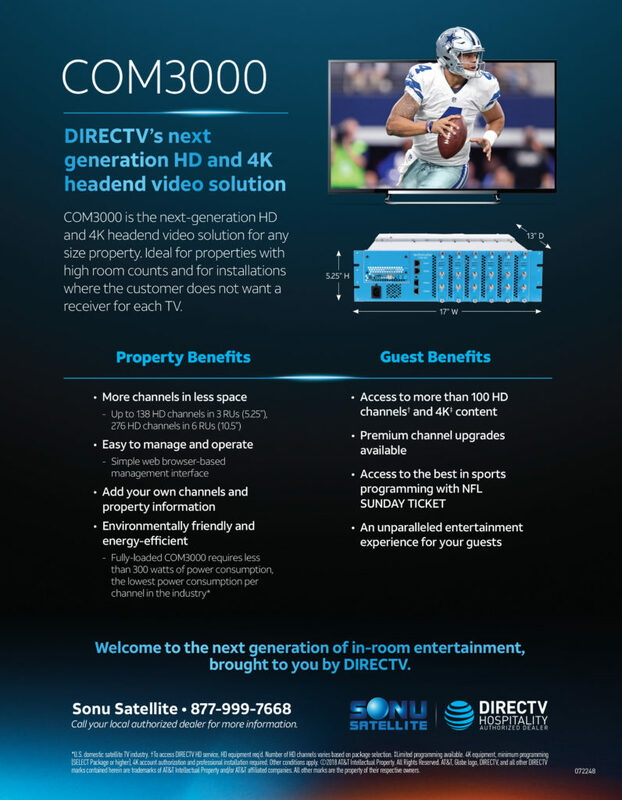 The DIRECTV COM3000 is the third‐generation commercial headend TV product which takes the existing reliable COM platform to a whole new level of value. With QAM and IP outputs, the COM3000 is the ideal solution for Hotels, Motels, Hospitals, Universities, Rehab Facilities, Office Buildings, Senior Living Communities, Warehouses, State/Government Facilities, Bars, Restaurants, and all other multi-room commercial properties. The COM3000 offers the most channels packed into an extremely small footprint. You can now carry up to 23 HD or SD channels per blade, and up to 138 channels per chassis. All within an easily expandable platform made to display your dream channel package. 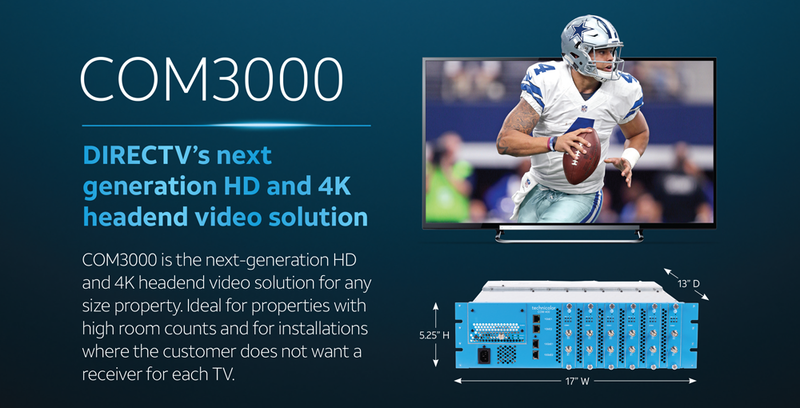 The COM3000 supports 4K HDR Satellite Broadcast Channels, giving your business the resolution of programming to go along with your impressive 4K commercial TVs. Locally manage your COM3000 network through an integrated web interface, or manage multiple properties via a single centralized hub. The DIRECTV COM3000 Headend is also both energy-efficient and simple to install. It has been FCC-Tested and proven to use only 300 watts of power consumption, making the COM3000 the lowest consumer of power in the commercial television industry. This unit is qualified as “Plug & Play”, and extremely similar to the COM2000 for installers. It has also been engineered to be backward-compatible for the expansion of existing deployments. This equipment truly takes both DIRECTV for Business and the commercial television industry to a great new level, and we are proud to offer it to your business. Contact us directly to speak with a qualified DIRECTV for Business agent, and we will guide you through the great commercial promotions available from DIRECTV. Sonu Satellite has been serving businesses nationwide for over 20 successful years, and our installer network reaches every corner of the continental United States. No job is too big or too small!